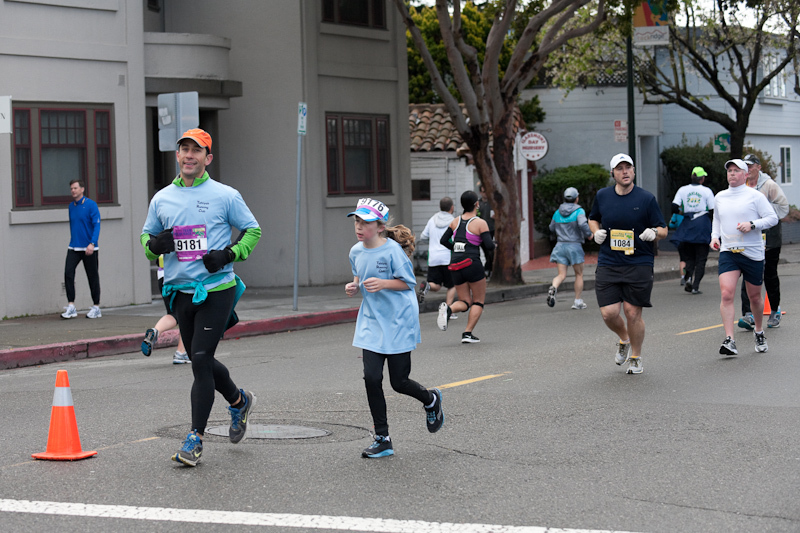 I haven’t put as many running (or cycling) miles in this year compared to last, but I was still excited to check out the runners at this year’s Oakland Marathon. 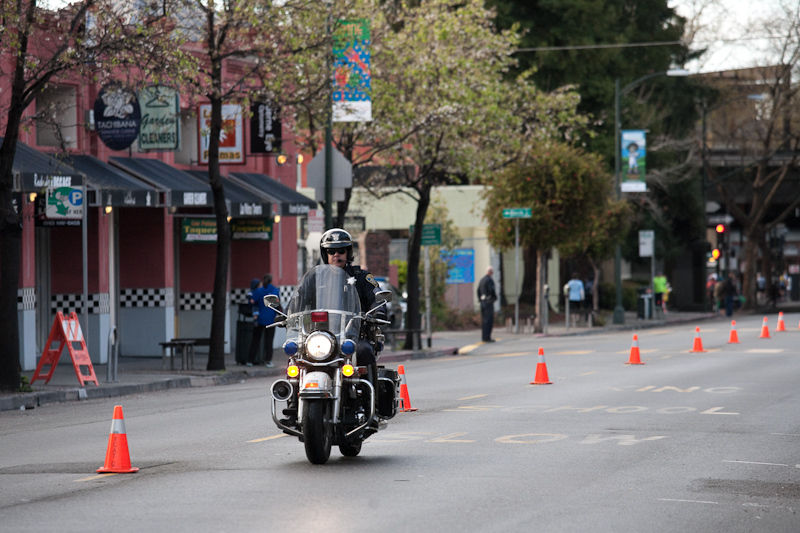 My girlfriend and I got up early to head over to College Avenue in Rockridge and see the runners between miles 5 and 6. The weather forecasts were calling for rain, but as we parked our bikes the sun was starting to shine through the clouds over the Oakland hills. The pavement was wet from last night but it was starting to dry. We had a few minutes to spare and stood around watching volunteers direct traffic and the TranSports crew set up their water station. A lot of drivers were confused by the road closures and some tried to get onto the course to get to where they were going. Perhaps there should be more signage next year for drivers? The results aren’t yet available off of active.com as of 1:16pm (“We are experiencing higher than normal volume and are therefore unable to process your request at this time.” ) today but this was the 1st place runner and eventual winner Chris Mocko from San Francisco at the mile 5 mark. 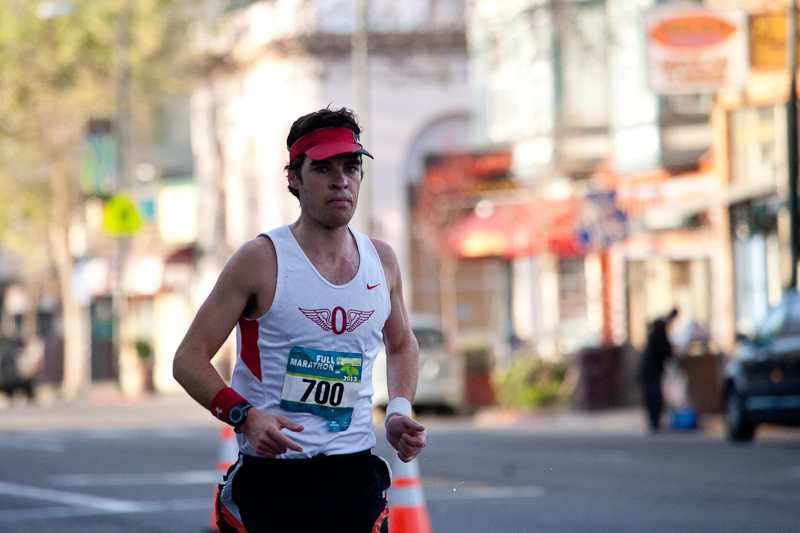 He finished with a time of 2:28:09, setting an event record. 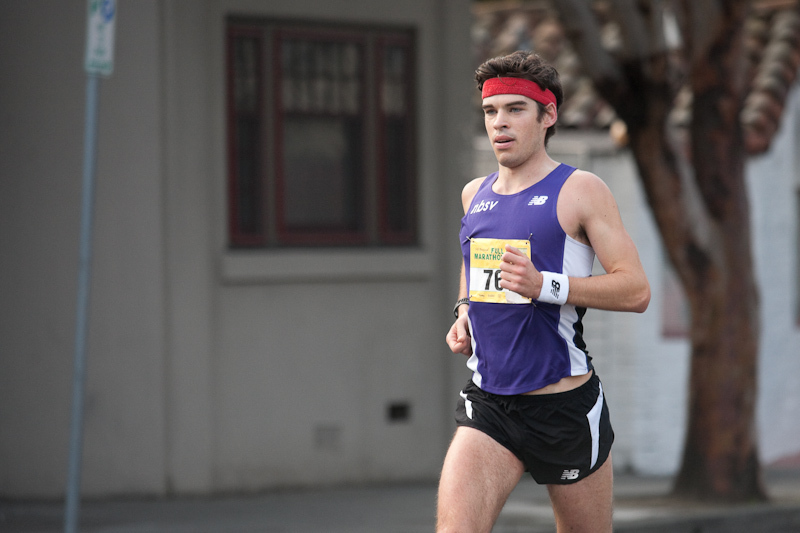 1st place winner Chris was decked out in New Balance gear – as part of the New Balance Silicon Valley team. 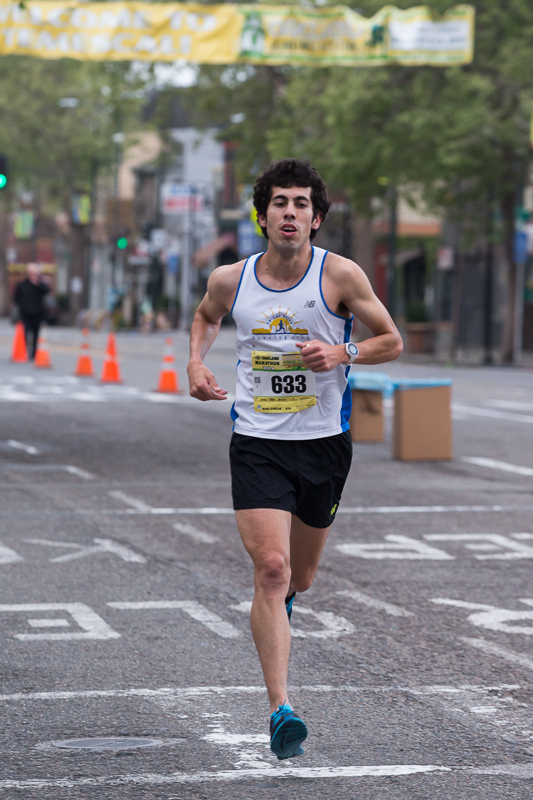 Tony Torres of Cedar Glen finished 4th last year and was in 3rd place at this point. Nike representing here. 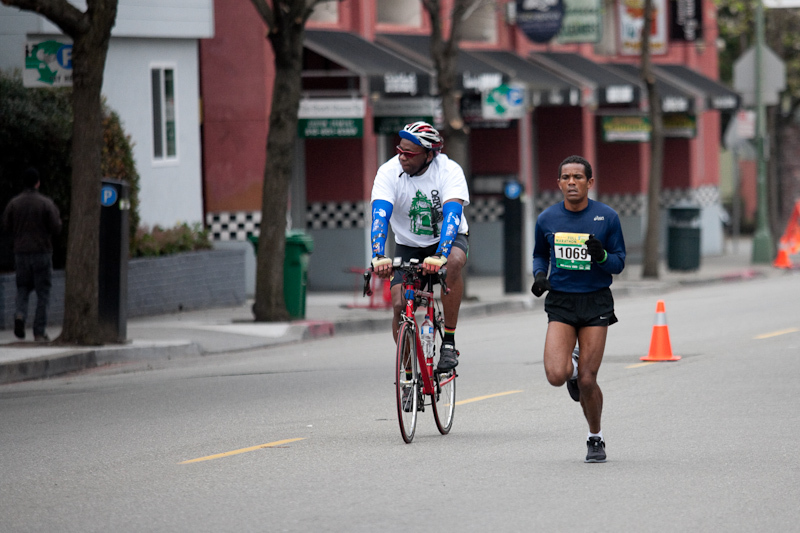 He went on to finish the race in 3rd place with a time of 2:38:05. 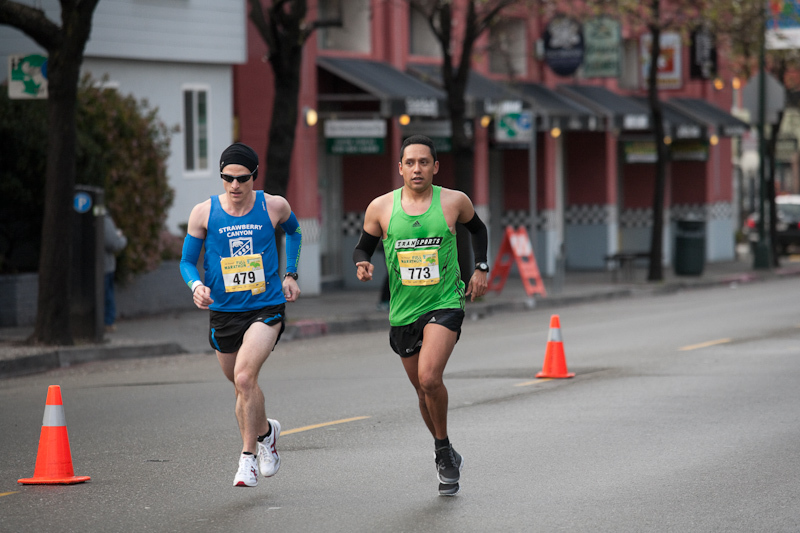 This pair was in 4th and 5th place at this point. 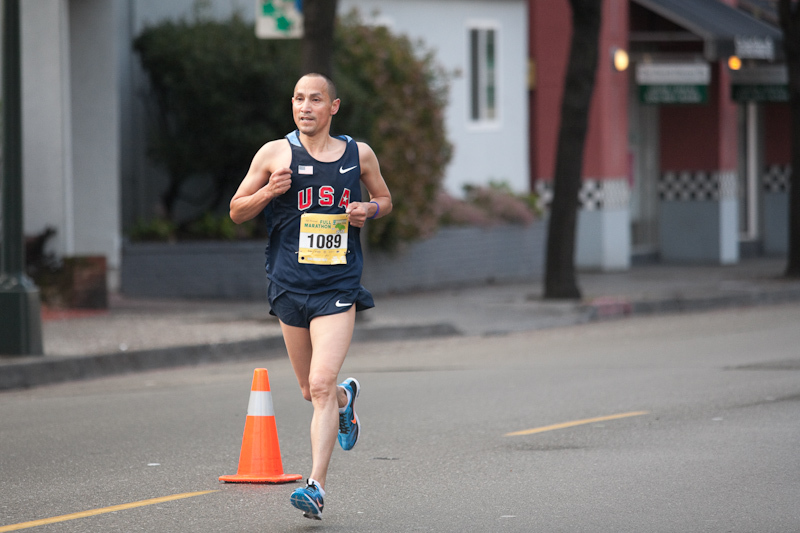 Steven Moreno (#773) eventually pulled away to capture 4th place with a time of 2:41:18. 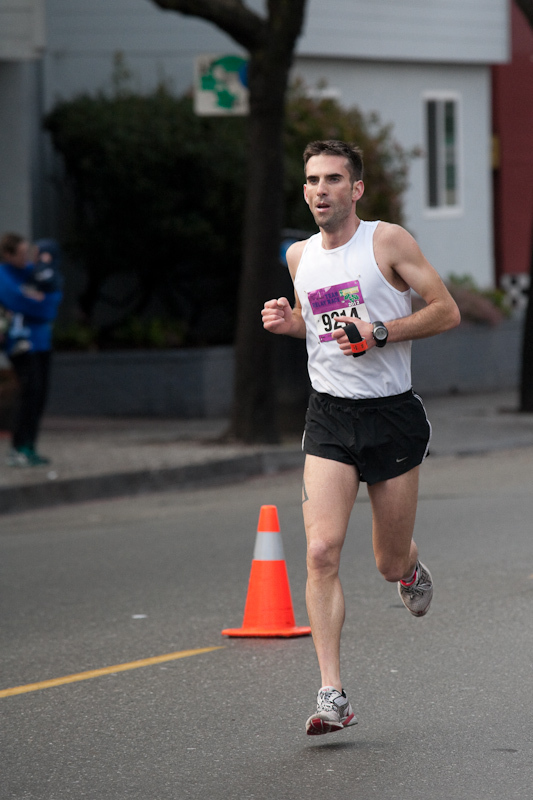 Christopher Gurney finished 5th with a time of 2:43:29. Both of the guys are also from Oakland. 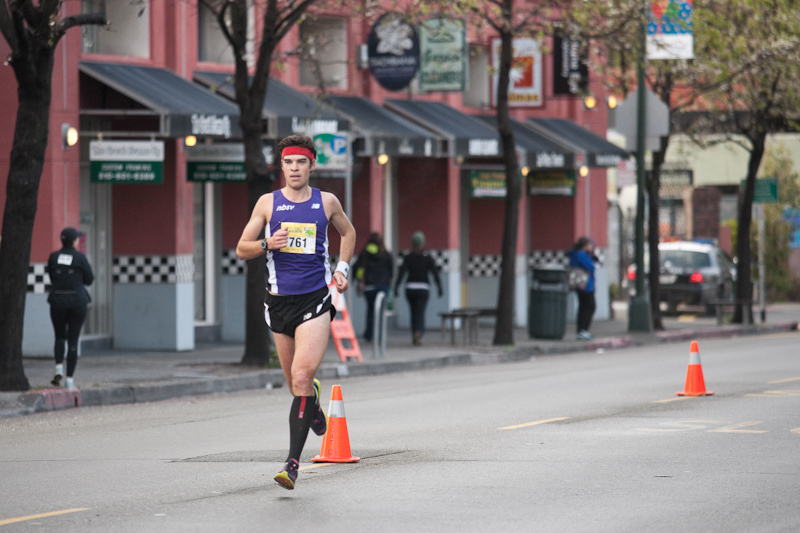 The 6th place male runner at mile 5 for this year’s 2012 Oakland Full Marathon. 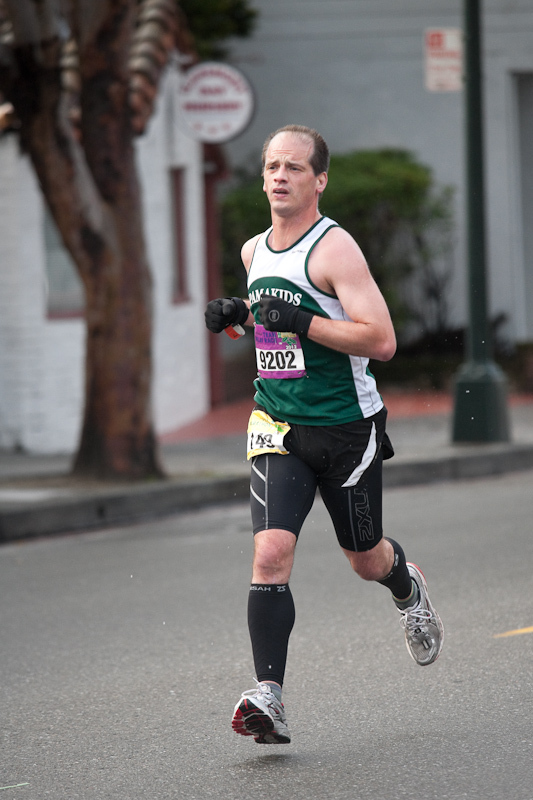 Andrew Willis, of San Jose, finished in 14th place at 3:02:48. 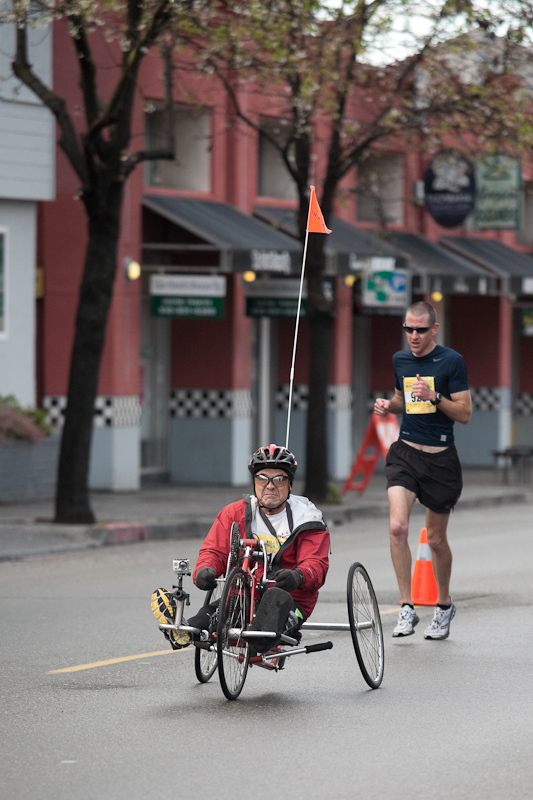 This guy was the first place relay member at mile 5. Their team, “Wild Dogs”, went on to win the relay with a finishing time of 2:29:57. The 2nd place relay team at mile 5. 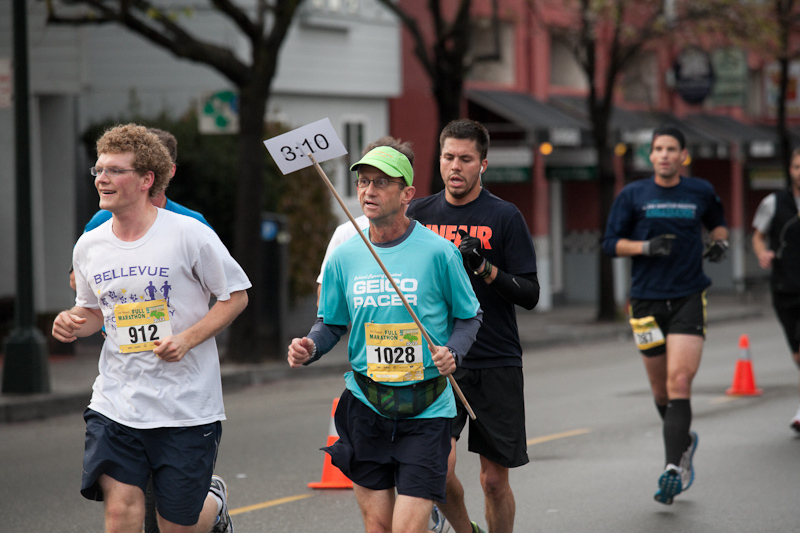 Their team, “Three Men and a Kid”, finished 2nd with a time of 2:46:17. A guy on a hand powered bike with the GoPro hero in front. 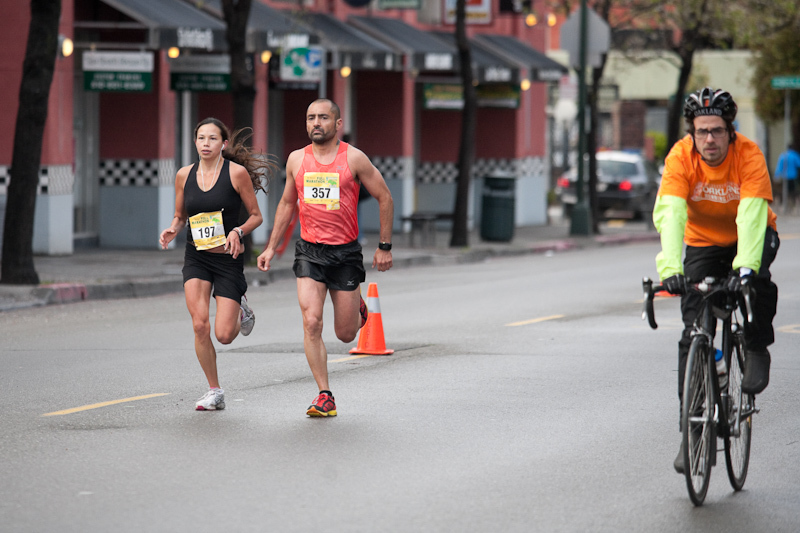 This is a photo of the 2nd and 3rd place female runners at mile 5. 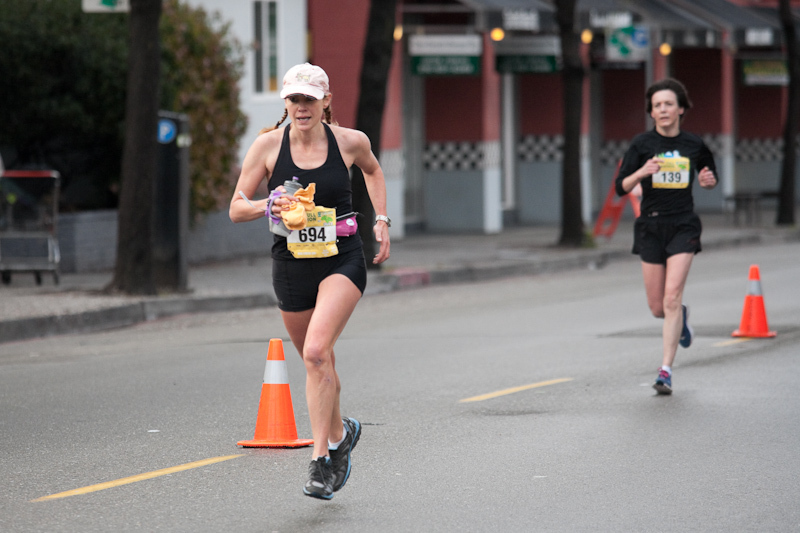 Runner #694, Penny MacPhail of San Anselmo, finished 3rd with a time of 3:12:18. 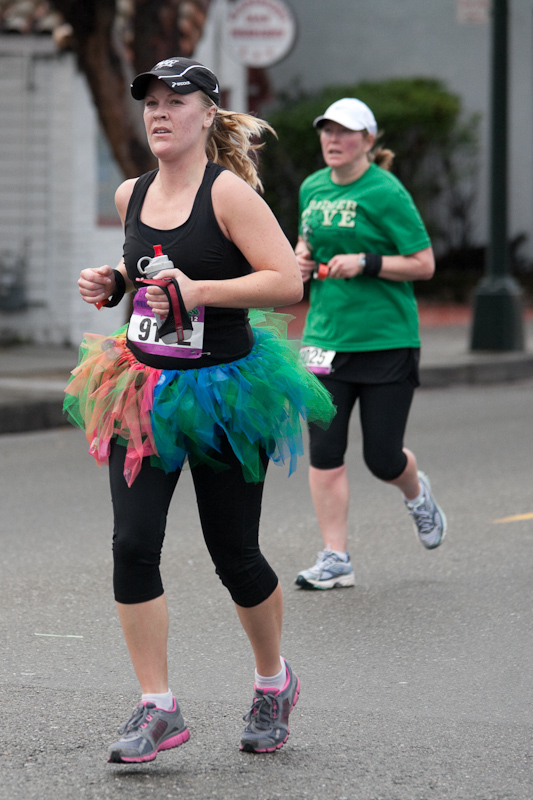 Claudette Augert (#139) of Edmonton, Alberta, finished 6th with a time of 3:20:47. 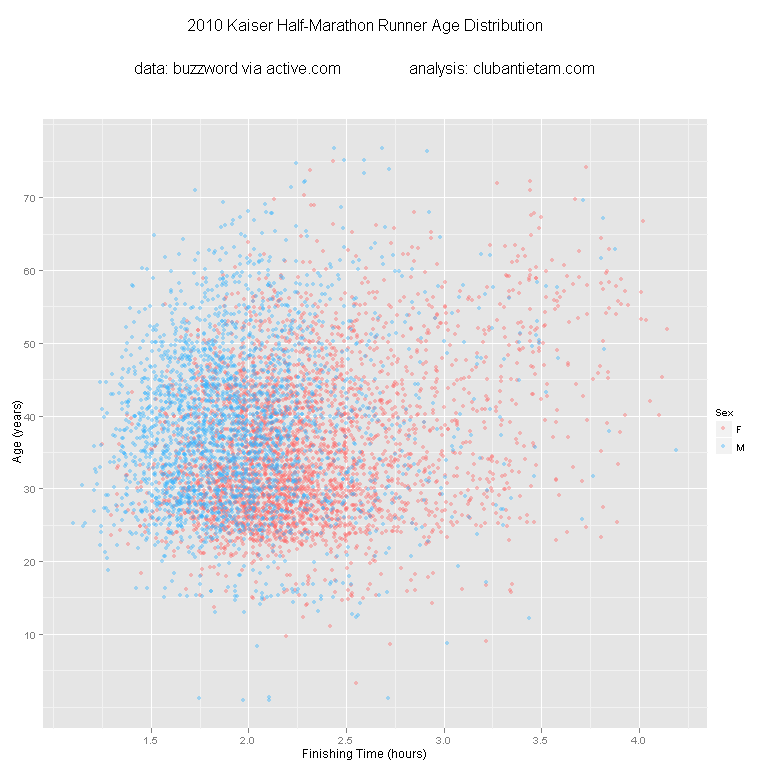 And the 4th place female runner at mile 5. 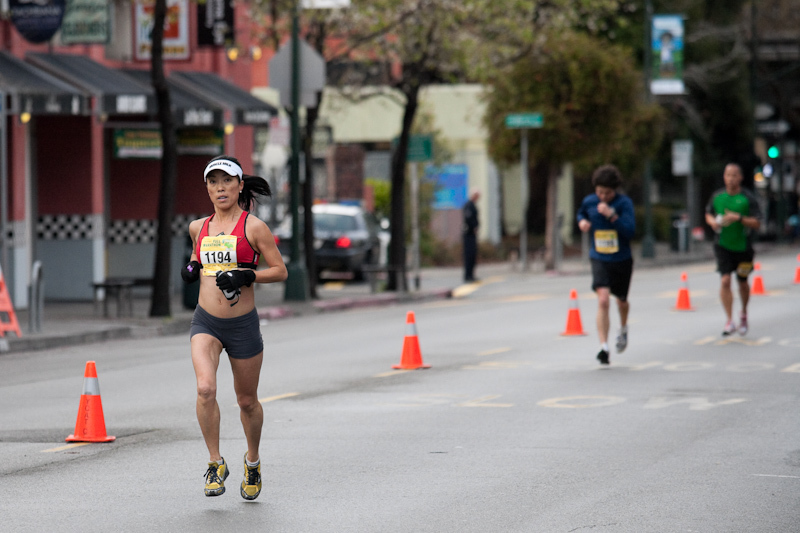 Monica Zhuang caught up a bit and finished the race in 2nd place with a time of 3:06:17. 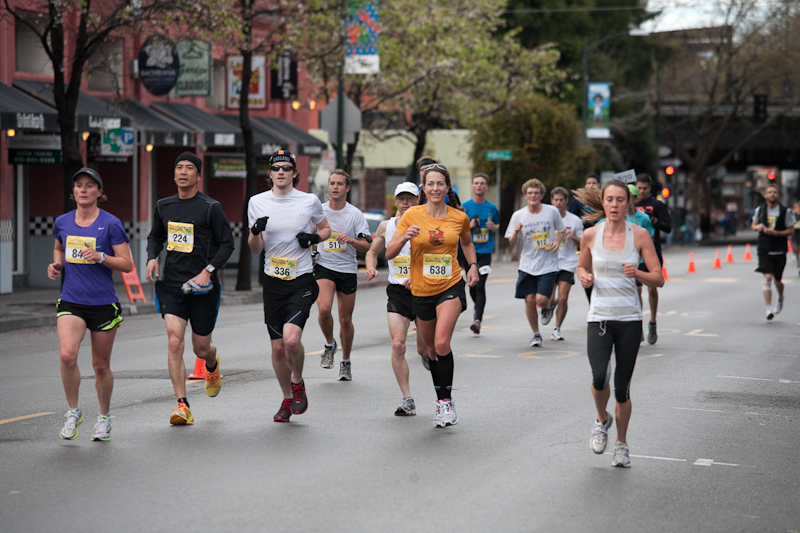 Once the super-speedy runners had passed, the race pack thickened up. Here is a group of slightly-less speedy-but-still-fast runners heading up the 3:10 pace group. 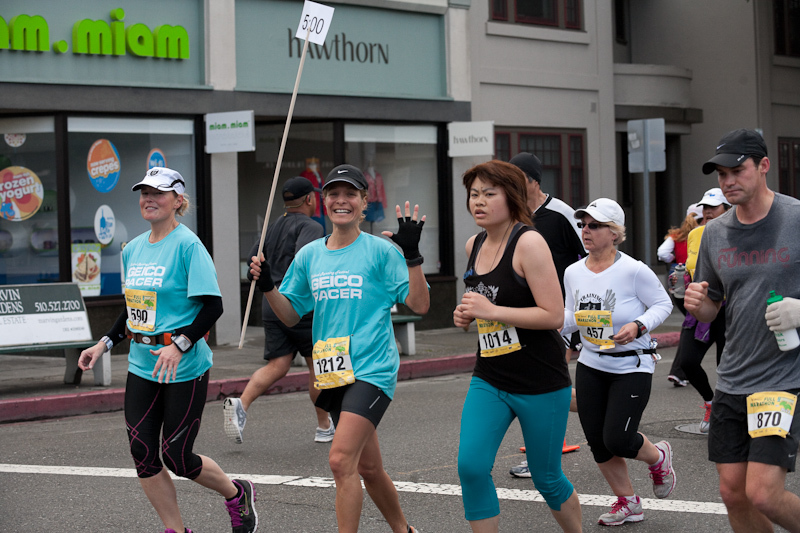 I dislike GEICO but I do like the Oakland Marathon Pacers! Here’s the 3:20 pace group. 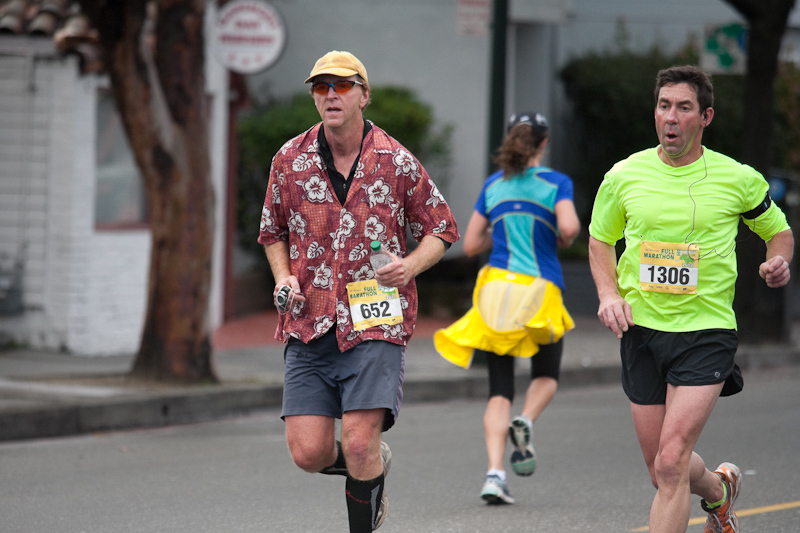 And here’s a guy running in his Hawaiian shirt. I think he did the same last year. 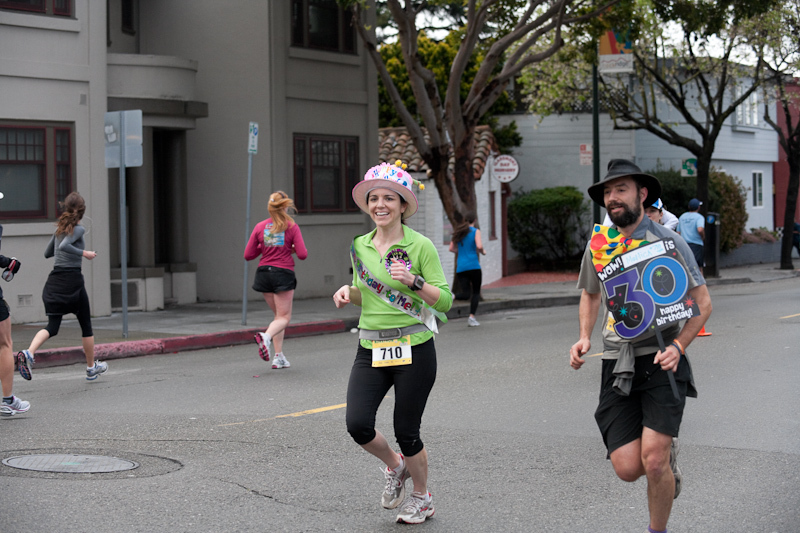 The Oakland Marathon was definitely no Bay to Breakers, but there were some people who had interesting outfits. This guy wins for the most color-coordinated. 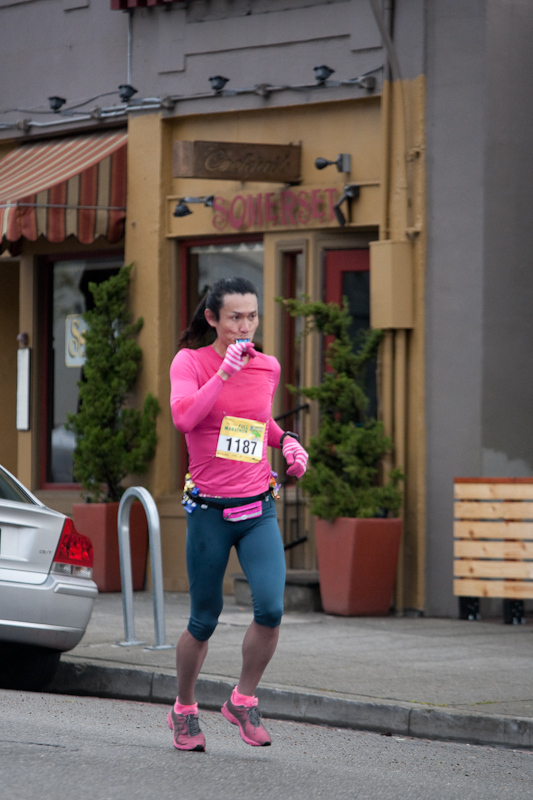 Pink shirt, pink gloves, pink fanny pack, pink socks and pink shoes. And check out all of those Gu/Clif Shot/Powergel packets. 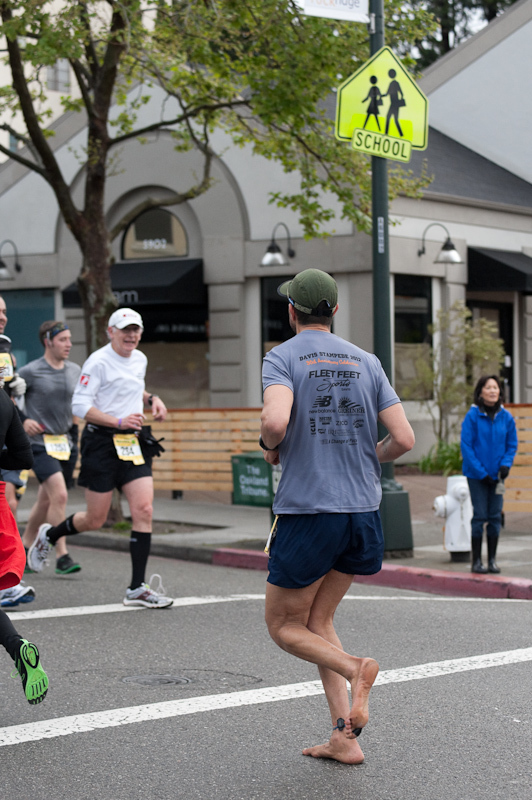 This was the first barefoot runner that we saw. Good job, guy! This woman was rocking her I hella heart Oakland shirt. 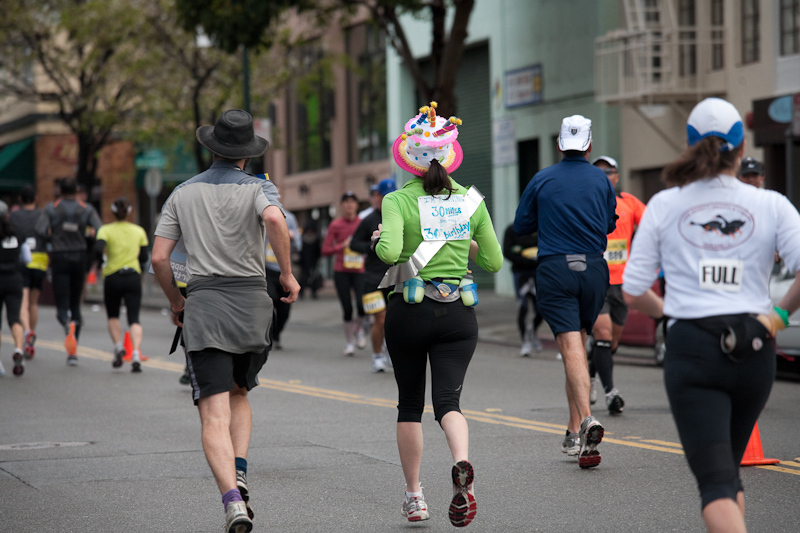 This woman was running with a birthday sash and hat and accompanying runner with a sign. Happy 30th, Monica! 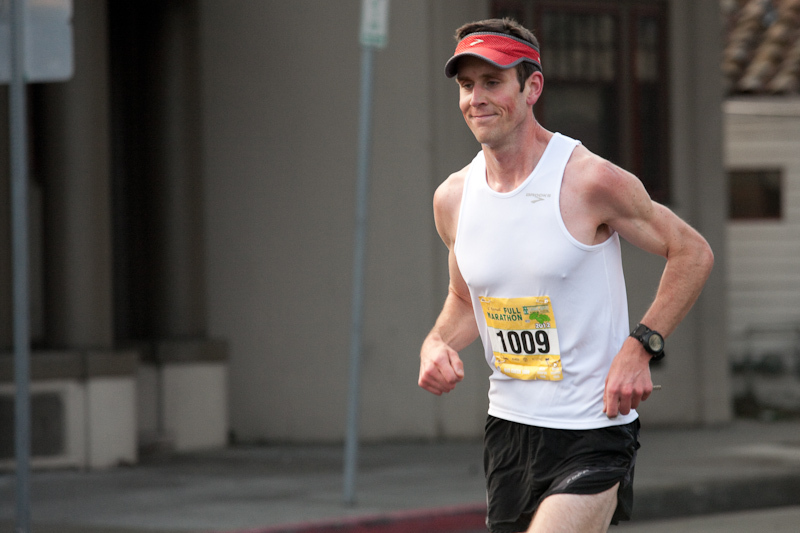 “I’m running 30 miles for my 30th birthday” – that is awesome. I wonder if she tacked on the extra 4 before or after the race. 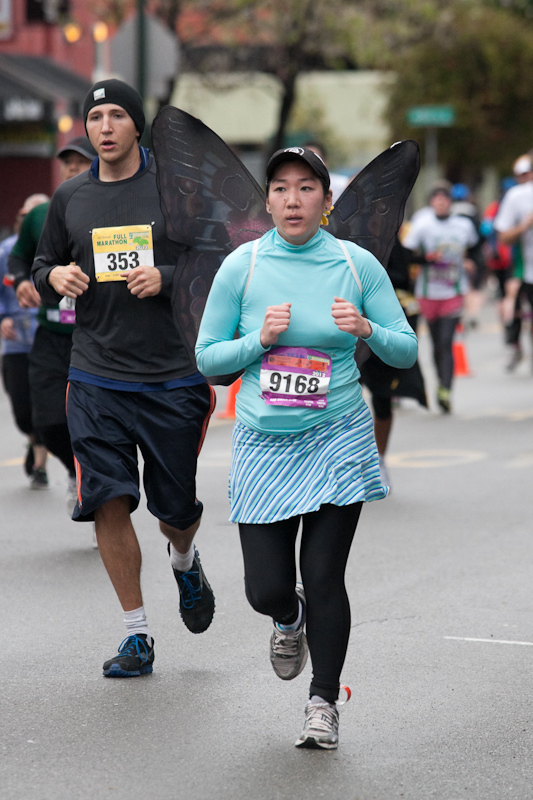 Relay runner with butterfly wings. 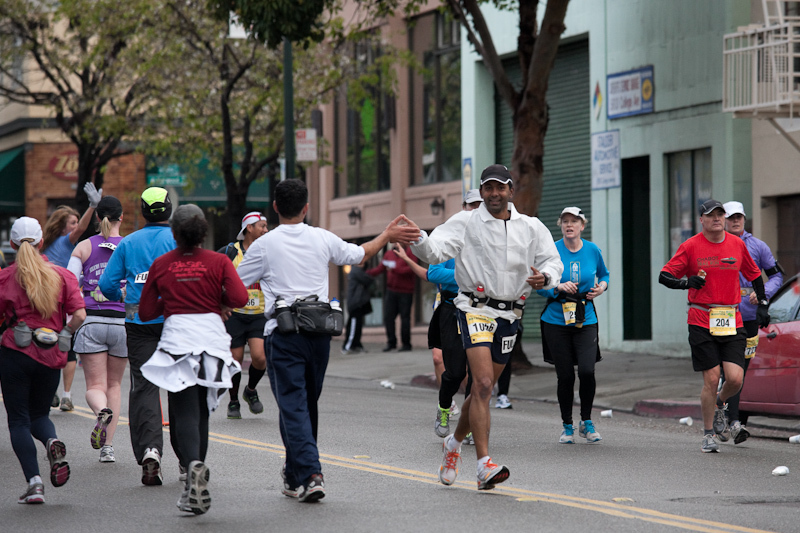 A course high-five. 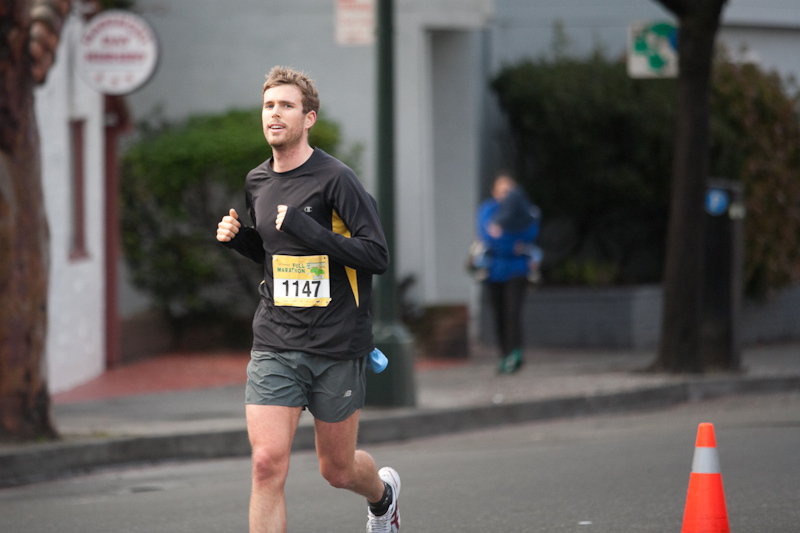 What is especially cool is that this guy ran the marathon in a disposable lab coat. 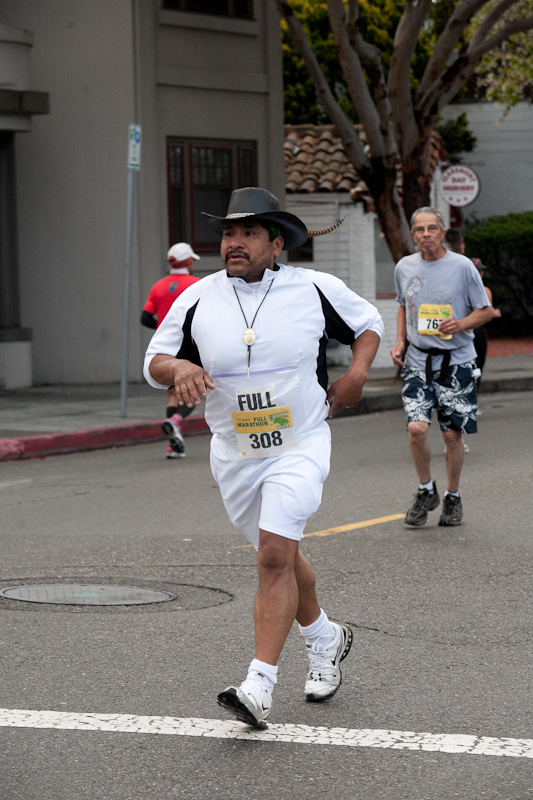 This guy ran in a feathered hat and bolo tie. This looks like a father and daughter team. The 5:00 pace group. Yay pacers! 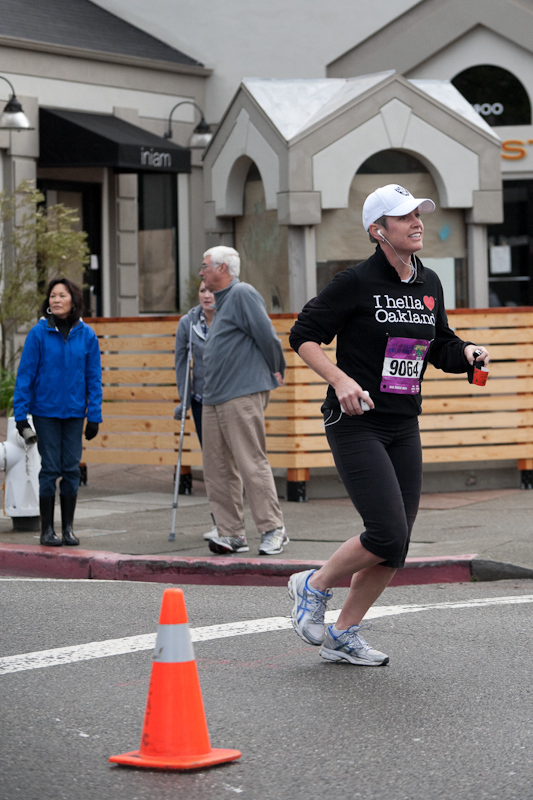 The Praying Runner. 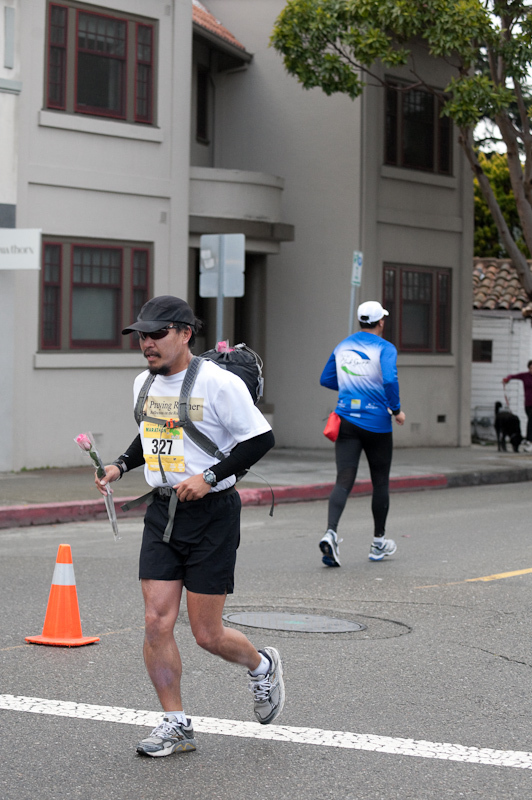 He handed out a rose at each of the 26 miles and was running to support women with breast cancer. 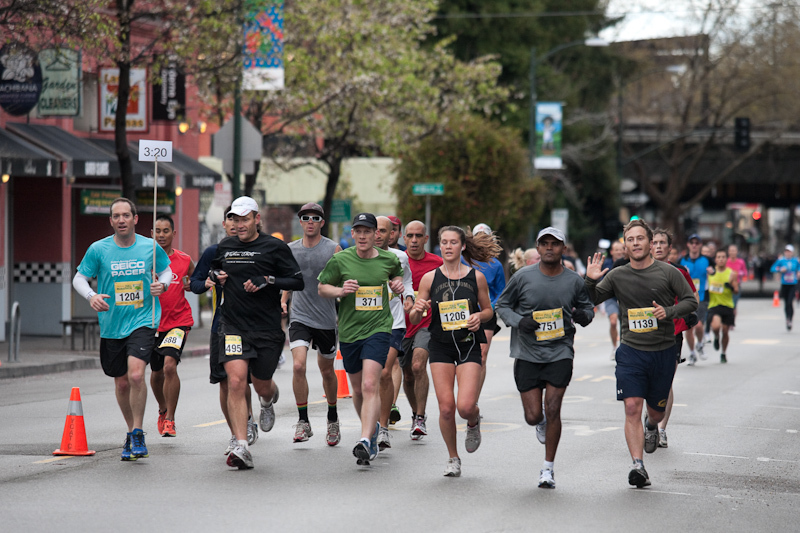 Great pics and coverage of the running festival! 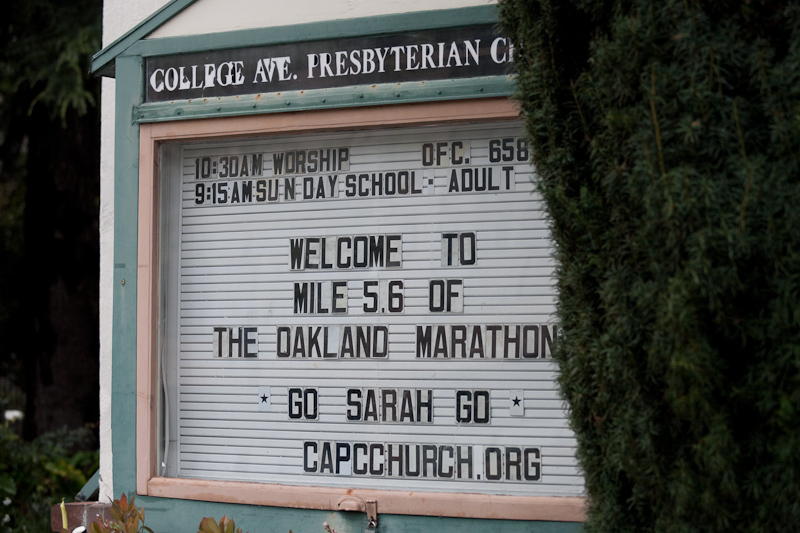 I was in Snow Park (my wife ran the 5K), and by Lake Merritt (at about mile 10.3 / 23.3) near the Children’s Fairyland sign. excellent pictures! 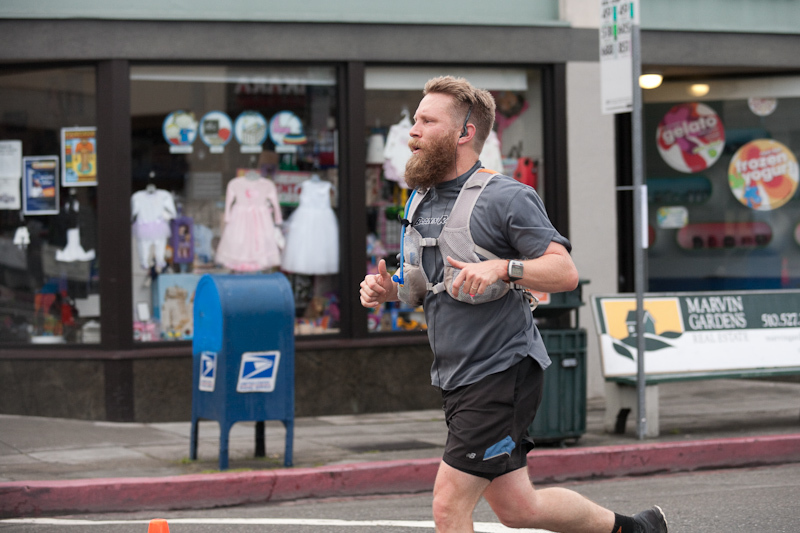 your “best beard” guy is Sam, the co-owner of Brazen Racing. love it!